Here is yet another winter vegetable that I’ve never thought of fondly…collard greens. In all seriousness, I felt the same way about collard greens as I did about kale. I had never tried it before our switch to real food, and I certainly didn’t have any plans to run out and buy any. However, once I started to understand the importance of eating locally grown foods that are in season, my views changed. So I set out to find a way to make collard greens into a tasty dish that didn’t take all day long to cook (it only takes about 25 – 30 min). Remove the center ribs from the collard greens and discard. Cut the leaves into small strips (we used culinary scissors). Place the greens into a large saute pan fitted with a lid. Turn the heat to medium, add 2 - 3 tablespoons of water and cover. Cook for several minutes until leaves are wilted. 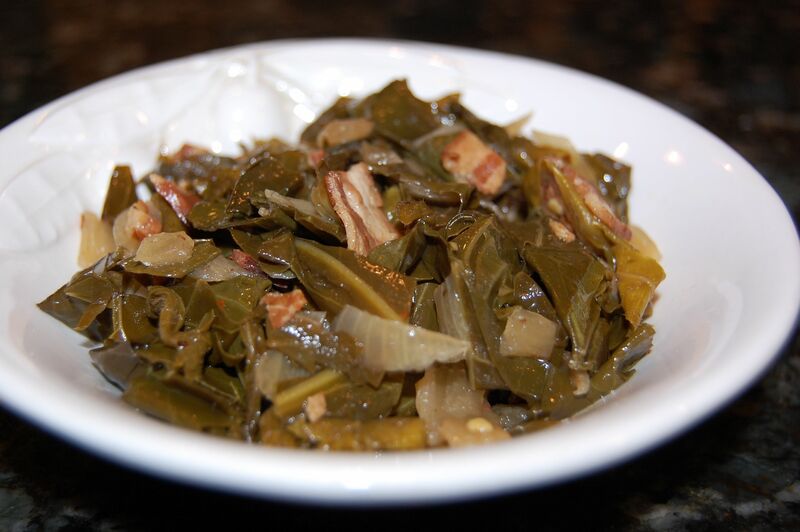 Transfer the wilted collard greens to a plate and wipe the skillet dry. Turn the heat back on to medium and cook the bacon on each side until brown. Drain the bacon on paper towels, but leave the bacon grease in the pan. Break the cooked bacon into small pieces. Add the diced onion to the bacon grease in the pan over medium heat. Cook until the onions are soft, about 2 minutes. Add the collard greens back into the pan along with the vinegar, maple syrup, red pepper, and 1/4 cup water. Simmer for 5 – 10 minutes until the liquid reduces then add the chopped bacon to the pan and season with salt (if necessary). We’re way up north but 2 of my 4 love collards! I had some great ones at a friend house once. She said all she did was sprinkle with water and & steam in the microwave. Haven’t been able to duplicate that one though so we cook them the way you do. I just made these tonight. My husband and I loved them! I had never had collard greens before and I was apprehensive about them but they turned out awesome! Thanks Lisa! I saute them with garlic and a bit of shoyu or tamari, sometime throwing in garbonzos, cashews and a bit of cooked quinoa. Or I just saute them and have sweet potatoes and scrambled eggs on the side for breakfast. Delicious! My 20 month toddler loves collard greens. He first had them from my husband’s grandmother and gobbled them up. Maybe you need to start them young to enjoy greens. I’ve also skipped the bacon and used carmalized onions in their place with good results. Not bad at all. I make mine in the pressure cooker with a bit of bacon, and the zest and juice of an orange. Oh, and a touch of garlic. Wonderful stuff. Add cornbread and beans and you have a whole meal. These were wonderful! Thank you for sharing. I was out of cider vinegar so used balsamic instead. Yummy! Just tried this and it was very tasty. My husband and I live in the Caribbean and have never had collard greens in our life until now. A neighbor brought some over from his garden. Nice! Not bitter, like I thought..
Why discard the center ribs? I know they’re tough and unappealing however, I chop them up very fine and cook them for 10 minutes first. You can’t tell it and I’m thinking it must add some more fiber to the mix. I made these last night and it was delish! DH usually hates greens and he had two servings and loved it! These are my newfound vegetable and favorite new recipe!!!! Thank you so much Lisa for posting this. I don’t like them sweet so I just omit the maple syrup and their fantastic. I Love Collard Greens, i don’t even cook in some liquid first,I just saute with some oil, onion and Garlic..yummy! I’ll have to try this recipe too!! Thanks Lisa. My family has a recipe where we cook a big batch of greens on top of chicken on the bones in a dutch oven- when the chicken is done, the greens finish cooking in the chicken juice while someone shreds the chicken to add back in. The only seasoning I think we use is black pepper and a little soy sauce- it’s one of my favorite dishes from childhood! in a big stock pot brown the bacon. add onion and saute. add garlic. add collards, broth, and the rest of the ingredients. cover and simmer at least 2 hours… the longer, the better. You can even add a couple packs of chopped ham for more of a meal. the chicken broth gives it a yummy soup-like quality. Thanks for all of the inspiration for better health! I frequent this blog and recipe file on a daily basis and have shared it with many people. Collards are as southern as it gets. My kids love them they are 12 and 6 with a dash of homemade pepper sauce on top. I cook mine much the way that Rebecca does. I tried collard greens for the first time tonight as part of week 5 mini-pledge. This recipe was SOOOO GOOOD!!! OMG – this is my new favorite food! I’m doubling the recipe next time though – I only got 3 servings out of it. 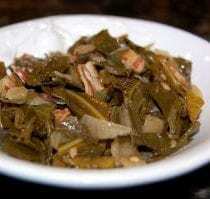 Before Food Network, I don’t think people in my region knew what collards were. I prefer Swiss Chard, which I know this recipe would work with. My mother used to make Wilted Lettuce, using leaf lettuce, cider vinegar, and bacon — no sweeteners. Made this cuz I was craving greens. Delicious!! Served with pork chops and mashed potatoes.